Simply taking any folder (or file), and then dragging and dropping it directly into an open Finder windows sidebar will add that item to the sidebar as a quick access link. This is super easy. You can even control where it goes by paying attention to where you drop it within the sidebar, a little blue line will indicate where the folder will end up, so you can place a folder precisely between two other sidebar items easily, or put it at the top or the bottom of the list, whatever you prefer. This works the same in all versions of the Mac Finder, regardless of OS X version. Whether using drag or drop or the keystroke method, you’ll find this to be especially useful for accessing frequently accessed folders and projects that you don’t want clogging up your Dock or cluttering the desktop. When you want to remove the folder from the sidebar, you can easily do so with a drag and drop trick too, the secret is to hold down the Command key and drag items from the sidebar to remove them instantly. Easy. This trick idea came via a comment on a post about customizing the Finder window toolbar that sits across the top of the screen, thanks to Bikorchi for the tip inspiration! Are you people serious??? Just don’t tell me in order to use my mac I should plug it in the wall outlet first. And hook up a monitor. This site should go beyond such ultra basic stuff. We have a diverse readership and try to cover a wide variety of tips at various skill levels to accomodate everyone. Regardless, thanks for the feedback and for reading! LOL, no apology needed, but thank you for understanding. Contrary to the others, I like these usability tips. Keep it up. A lot of tricks can seem useless to “old” Mac users. But they surely are very useful to “young” Mac users and to switchers. Holy Cow! I needed that! 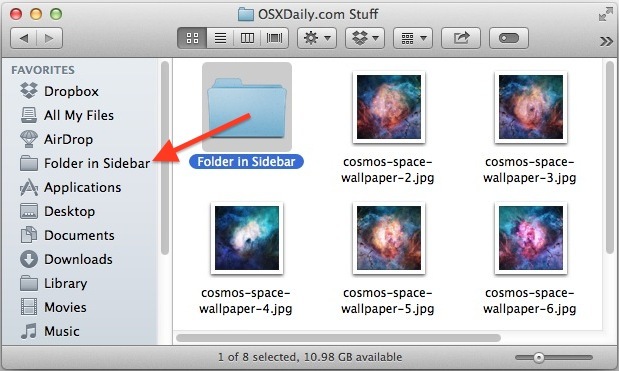 A few months ago, I found a way to add the alias of a network share to the Finder sidebar. Since then, I had removed the share from the network, but the link I had added to the sidebar remained. Unlike the other items on the list, where an Option+click gave multiple options (including remove), this single icon and label would not be removed. But success! Holding the Command key and dragging it off the sidebar did the trick! Thanks for the tip from a comment! Question, MacBook Air and home PC/Win7 – shared folder on Win7 ‘Photos’… can see it from Mac – Can’t add folder… can add any of the sub-folders easily to the sidebar – just not the top-level one that seems to be the share.. Any ideas? How do I make USB storage devices always appear in the sidebar? « iOS 5 to Enable Over-the-Air iOS Updates & Patches for iPhone & iPad?